Shetland cattle are a Scottish rare breed, classified by the Rare Breed Survival Trust as a Minority breed (between 750 and 1500 breeding females). 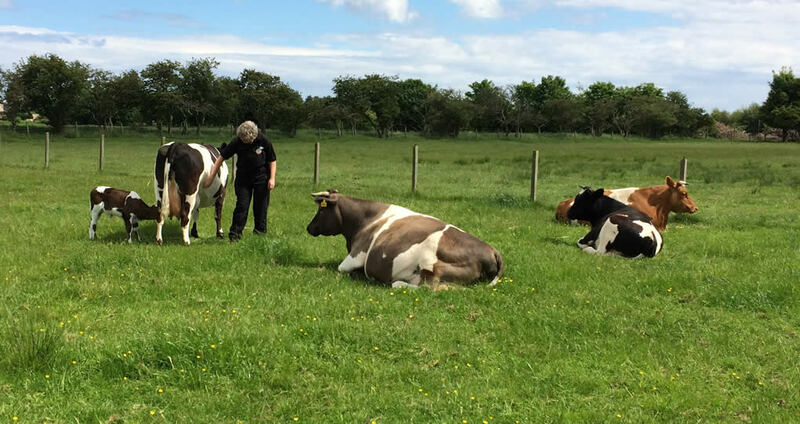 They are small, hardy cattle with horns; developed as a dual-purpose breed, they are the original “crofter’s kye”, producing milk for the crofter’s family plus a calf to keep for beef, as a replacement or to sell. 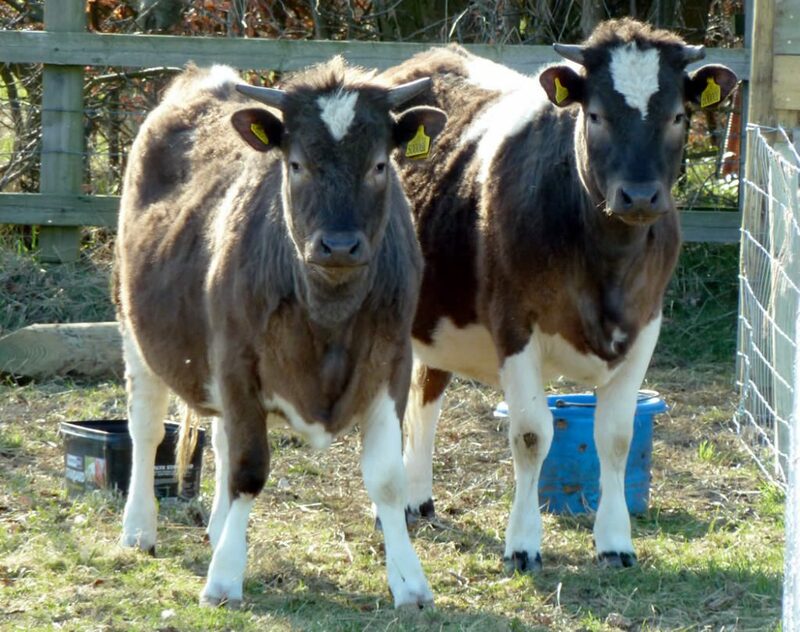 We bought our two original heifers, Breeze and Blizzard, from Shetland in 2010, when they were six months old. We now have three cows – Blizzard, her daughter, Annie, and Annie’s daughter, Rosie. We also have a young bull called Ace and four steers for beef. Generally, the cows calve in spring and summer. Our steers (castrated male cattle) have a diet of hay and grass, supplemented by a molassed mineral bucket and occasional sugar beet (to facilitate handling – they love it), which is a byproduct of the sugar industry. They are fed no cereals or soya. Usually born early summer, they stay with their mothers until they are around seven months old. After weaning, they live as a group with other steers for two winters and two summers before being killed at around 28 months. We always keep at least two steers each year so that the final journey is less stressful, as they travel together. Our cattle are killed at James Chapman’s, in Shotts and butchered by Minick of Ladybank. We would like to have them killed closer to home but there is a crisis in small abattoir provision in Scotland, which sadly prevents that. Ironically, the only way we can preserve these rare breeds is to eat them. Without a market for the beef, the breed will die out. Shetland beef is simply superb. Grown slowly on a forage diet, the beef has fantastic marbling, which makes it tender and flavoursome. It is high in conjugated linoleic acid (CLA), which is sold as a dietary supplement in health food shops and may have cancer fighting properties. We sell fresh beef boxes once in the autumn, when the cattle are slaughtered; thereafter we sell frozen beef and we generally have a range of cuts including mince, burgers, sausages, stewing, braising and casserole steak, sirloin, minute and rump steaks and various joints.